We should take the organizers of this confrontation at their word. Orchestrated by Hamas, approximately 40,000 rioters gathered at the border and several thousand tried to storm into Israel at 13 locations. The campaign’s title “March of Return” reflects Hamas’ aim: to break the border fence and storm Israeli towns in order to attack and kidnap Israeli civilians. The closest Israeli communities are only half a mile away from the border. Israeli soldiers have been defending the border from what could lead to a successful breach of the fence. In this way, Israel has been acting as any sovereign nation would be expected to. Israel made relentless efforts to prevent the Palestinian masses from violently breaching the border. These efforts included early warnings by leaflets, direct phone calls, radio and social media in Arabic, and other means. In contrast, Hamas is taking steps to exacerbate the difficulties faced by its own people, as a play for international condemnation of Israel. Hamas turned back aid trucks containing medical supplies donated by Israel after the supplies had already entered Gaza. Despite the deteriorating health situation in Gaza, Hamas refused this humanitarian aid, returning it to Israel. This happened a week after Palestinians had sabotaged the Kerem Shalom aid crossing multiple times, including blowing up gas pipelines, in an attempt to bring about total chaos. Israel’s need to defend itself and Hamas’ efforts to aggravate the plight of its own people are fundamental issues at the very core of the current violence. However, the way recent events have been framed does not do justice to the realities on the ground for either Israelis or Palestinians. The most puzzling aspect of the Israeli-Palestinian conflict may be that after 65 years of violence, enmity and suffering, it remains unresolved when coexistence is inevitable and a two-state solution remains the only viable option. The Arab-Israeli conflict is generally viewed as a political and territorial conflict, yet the underlying religious component has created a certain mindset that further complicates the struggle and adds to its intransigence. Both Jews and Muslims alike have mystified the struggle, projecting cosmic significance and introducing national and religious pride into the equation. Most Israelis believe that no distortion of history can deny the religious component that has created a bond, spanning thousands of years, between the Jewish people and the biblical Jewish land. Since the ancient Hebrews are not historically the same thing as Jews — not culturally and not even religiously — the Hebraic tradition of 3000 years ago, having little similarity to modern Jewry, hardly means an inheritance in land for Jews. That said, and with religious faith requiring no evidence, for many Israelis it is simply unacceptable to completely relinquish control of the West Bank, known in ancient times as the biblical lands of Judea and Samaria. From that perspective, it is inconceivable in particular for them to surrender their holiest shrine, especially the Wailing Wall (the outer wall of the Second Temple), allowing Jerusalem to be governed or fall under the jurisdiction of any other peoples or an international governing body. As a result, despite all Israelis happily accepting the 1947 UN partition plan, they have always held onto the dream of eventually repossessing all of Jerusalem, particularly the Old City. This unique attachment and affinity to the holy city, which has for millennia symbolized the Jewish sense of redemption, created a powerful motivation to capture the city when it came within their grasp during the Six Day War in 1967. The fall of Jerusalem in the wake of the war remains an unmatched event and came to symbolize Jewish absolution. This historic development created a renewed awakening that vindicated the religious premise which was embedded in the Jewish psyche for centuries. The realization of what was believed to be a far-fetched dream under the most difficult of circumstances was now seen as the work of the Almighty that no force can alter. Considered in this light, we can understand or at least provide a framework for the zeal of those who are committed to keeping all of Jerusalem and much, if not all, of the West Bank under Israeli jurisdiction — they see that as the fulfillment not only of God’s promise but God’s very will. What further explains the mindset of these believers is that no man can reason to the contrary of God’s plan. Regardless of the facts on the ground (the existence of the Palestinians and their claim to East Jerusalem), the Jews in and outside Israel consider it their obligation to do everything in their power to fulfill God’s will, which transcends humanity’s narrow perception of reality. This explains the position of many Israeli Jews who see no wrongdoing in building new and expanding existing settlements in the West Bank, particularly in East Jerusalem. From the settlers’ perspective, they are merely fulfilling what God has ordained; for the Jews to earn the right to hold onto Jerusalem they must prove that they are worthy to repossess it, even if this includes the suppression of the Palestinians and defiance of the international community. For these reasons, regardless of how powerful the resistance of Palestinians, other Arab and Muslim states, and much of the international community to the Israeli position, the religious mandate trumps any and all opposition: the settlers view themselves as pursuing God’s mission and must demonstrate unshakable resolve, tenacity and willingness to make any sacrifice necessary before He once again grants them the Promised Land. With the recapture of Jerusalem and control asserted over the West Bank, what seemed to be destined to remain only a pipe-dream was suddenly transformed into a reality. This development was then strengthened by concerted efforts towards creating permanent anchors on the ground through building settlements and infrastructure needed to augment continuity. 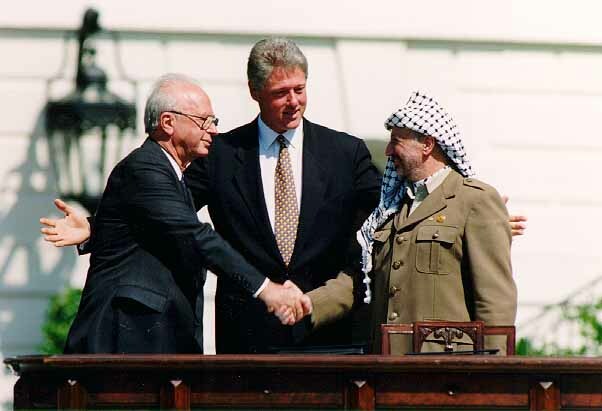 These efforts led to the gradual galvanization of intergroup factions, especially the settlement movement, which has gained tremendous political sway and uses it effectively to block any policy or action on the ground that could compromise the settlement enterprise. Indeed, successive Israeli governments, regardless of their ideological leaning, have bent to the settlers’ whims. The expansion of the settlements, along with the prospect of building the young Jewish state on the entire mythological ancient homeland, has created this particular and most powerful psychological disposition. As this religious mindset has become even further embedded in the Israeli psyche, the nearly decisive power of the settlement movement has made it increasingly difficult to contemplate a return to the 1967 borders, with or without some land swaps. Due to religious convictions tied to Islam’s third holiest shrines in Jerusalem — the Al-Aqsa Mosque and the Dome of the Rock, or “Haram al-Sharif” — Muslim leaders, like their Jewish counterparts, will not compromise on Jerusalem or on recovering much of the West Bank’s land. Many Muslim scholars believe that Muhammad made his Journey from Mecca to the Al-Aqsa Masjid (literally, “furthest mosque”) in Jerusalem before he ascended to heaven. Although the Al-Aqsa Mosque was built long after the death of the prophet, Surah 17:1 states that Mohammad visited the site where the Al-Aqsa Mosque was subsequently erected. This belief is certainly not limited to the Palestinians but shared by all Muslims, further complicating any solution to the future of Jerusalem. Like the Israelis, the Palestinians too have shown absolutely no flexibility in this regard. One other difficulty that adds to the psychological impediment in relation to Jerusalem is the Palestinians’ sense of ownership, which has been uninterrupted for centuries. Although Arabs have lived with Jews in relative peace, Jews were treated as second-class citizens, who in turn largely accepted subordination in order to maintain peaceful relations. Centuries of Arab perception of Jews as a subordinated minority make it nearly impossible for them to accept Jews as equals, not to mention as a superior power forcefully usurping land they consider their own. The Palestinians’ position in connection with Jerusalem and the entire West Bank must therefore be seen in this context as well. Further consideration of the Arab view of Islam as the final revelation of the three monotheistic religions (including Judaism and Christianity) and of Muhammad as the last prophet accentuate Palestinian and Muslim unwillingness to compromise in what they believe to be their inherent religious duty to obey God’s final revelation. Here again, the psychological barrier embedded in religious precepts creates a mindset willing to defy reality. Yet, no one is permitted to challenge God’s decree and Muhammad’s edict. In The Future of an Illusion , Freud made the claim that religious beliefs should be viewed as wish-fulfillments — or beliefs chiefly motivated by deep-seated human wishes, i.e. illusions. When we look without bias at the beliefs held by so many on both sides of the Israeli-Palestinian conflagration, who could not help but agree with his assessment? Of course, an illusion could turn out to be true: the belief that the Jewish people would someday establish a mighty state on the very same land where their ancient ancestors once lived was certainly illusory only a hundred years ago. Even if we agree with Freud that religious beliefs are illusions, we cannot agree with his prediction that such illusions are likely to wither away any time soon. In the final analysis, religion has been and will most likely continue to be the repository of our most deeply held wishes and beliefs, as it is for many Israelis and Palestinians alike. For believers on both sides, religion constitutes nothing less than the very substance of their lives, the core of their existence and world-view. The question is: can both parties be brought to reconcile their beliefs to the changed reality on the ground? Neither Israelis nor Palestinians can be expected to undermine their most cherished religious convictions, but if disappointments are unavoidable, the convictions recognized and honored by the other side and by the global community must be adapted and reinterpreted in light of new and undeniable conditions. To take a crucial example, while neither side can forsake Jerusalem without compromising their religion, they can begin to accommodate their aspirations to the prospect of Jerusalem as the dual-capital of two sovereign and independent states. Perhaps then the historical and religious commitments of both sides can be respected. It is only through mutual realization of spiritual hopes and ideals that Israelis and Palestinians will reconcile and see the fulfillment of God’s promise of peace — and that is surely no mere pipe-dream. Alon Ben-Meir is a professor of international relations at the Center for Global Affairs at NYU. He teaches courses on international negotiation and Middle Eastern studies.